Can Bad Neighbors Ruin the Perfect Real Estate? Anytime you move into a new house, you probably wonder who lives next door. If you haven’t had time to do any neighborhood research before, then you may discover this as time goes by. However, if you’re purchasing a house to rent out, this is important information to have first. If the neighbors are not desirable or seem to have more than their fair share of trouble, this could spell out future trouble for you as well. So how do you protect yourself from these kinds of events and make sure your property is attractive to renters? There are preventative measures you can use to deter problems and help the family feel secure no matter what. A fenced yard always adds a measure of security and helps the home have a closed feel to it. 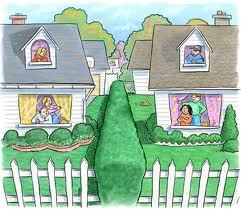 The neighbors will be far less inclined to walk through the yard or invade the space of the occupants of the house. Even if the fence is short, this achieves the same objective. Security cameras are a benefit to everyone and could even help you save on your homeowners insurance. If you have these installed along with a recording system, then whoever lives there will have the benefit of this video surveillance. Criminals do not want to be recorded during their various acts and will stay away from the property. If you have a video surveillance system installed and then post signs about it, neighbors tend to behave better in general. When you’re trying to shut out the neighbors but maintain the beauty of the lot, shrubs and trees are always a nice choice. These require regular maintenance but they also create established vegetation over time increasing the property’s value. As well as your regular fence, these create a fence of a natural kind and will help to keep out unwanted guests. By using a combination of these features above, it really doesn’t matter who the surrounding neighbors are. You can create your own slice of heaven on a busy or a quiet street. Any improvements you make inside the home will help achieve this as well. For example, if the house is located on a busy street, perhaps some sound-proofing insulation will be desirable. Features like this can help a renter or occupant overlook what is outside and focus on what they’ll be paying for each month. These and other real estate improvements will help you make money with any property.